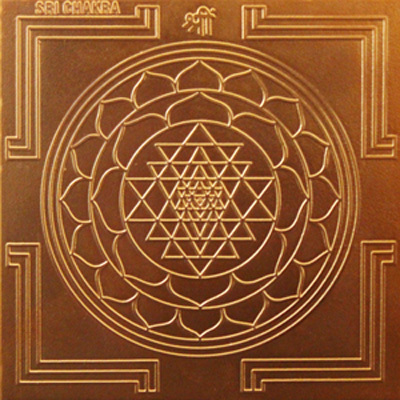 Sri Chakra Yantra or the Sri Yantra is your magical wand to invoke all the riches. Let your life be the synonym of prosperity! Goddess Tripura Sundari adds enchantment, prosperity and happiness to your life. The energized radiations from the Yantra stimulate your thirst to acquire money, material comforts and wealth. It lays a luck strewn path for your success! The nine interlocked triangles in the Yantra surround and radiate out from the bindu point (the seed center), the junction point between the physical universe and its source. This powerful geometric pattern is an avenue for you to access the Goddess of wealth. She energizes you with the waves of divine energy that accumulate money and other material comforts for you. Your sincere prayers to her Yantra will fulfill every desire of yours, and you will be completely power packed to stand out in a crowd! How to Use the Sri Chakra Yantra ? Take advantage of the “Windows of Time” that when open are most favourable and supportive to “Bust Your Karma”. An Anointing/Hydration Ritual/Abishekam to the Shiva Lingam performed at these special times helps to dissolve your karma. It is beneficial to do this ritual anytime however it has more potency and effect during daily Pradosham time or of course on the 13th Moon Phase.